Faced with a layover at Dubai airport? 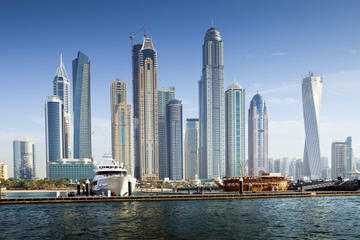 Check out Dubais highlights on a 4.5-hour private layover tour, with round-trip airport transfers included. Travel in a private vehicle with your own guide and admire spectacular landmarks including the sail-shaped Burj Al-Arab, Burj Khalifa and more. Plus, see the citys old wind-tower houses, visit Dubai Museum, cross Dubai Creek on an abra water taxi, and visit the Spice and Gold Souks. With a flexible itinerary and just five miles (3 km) between the airport and the city, its an ideal stopgap between flights. Start your layover tour with a pickup from Dubai International Airport at a time that suits your flight arrival. Hop inside your air-conditioned private vehicle and set off on your tour of Dubais highlights. Chat to your guide about any sights you want to see more or less of  as this a private tour, the itinerary can be tailored around you. As you travel, hear fascinating facts about Dubai and its incredible transformation from a fishing port to the city it is today, all since the discovery of oil in the mid-20th century. Snap photos of the sail-shaped Burj Al-Arab, one of the worlds tallest hotels, and catch glimpses of the soaring 2,716-foot (828 meter) Burj Khalifa, the worlds highest building. Continue into Jumeirah, one of Dubais upmarket residential areas, and admire Jumeirah Mosque before driving to the Al Bastakiya quarter, home to a cluster of restored courtyard houses with traditional wind-towers. Stretch your legs around the narrow lanes as your guide explains how the towers capture and circulate cool breezes, and hear how the area was first settled by pearl and textile merchants in the 1900s. Stay on in Bastakiya to visit Dubai Museum, housed in the 18th-century Al Fahidi Fort. Head inside with your guide to chart Dubais history through the interesting exhibits and learn about life here before the oil boom. Next, board a traditional abra water taxi to sail across Dubai Creek, the central waterway, to the Deira district. Absorb the city views from the water and breathe in the heady aromas around the colorful spice and herb stalls of the traditional Spice Souk. From here, head to the Gold Souk and browse for bargains at the myriad of shops glittering with gold, platinum and gemstones. Then, when the time comes, your tour ends with a drop-off at Dubai International Airport.